The Football Associations of England and Scotland say they will defy a ban on players wearing poppies when the teams meet on Armistice Day. The FAs will let players wear black armbands with poppy emblems and are willing to accept any punishment. Fifa general secretary Fatma Samba Diouf Samoura told BBC Sport "any kind of sanction" could follow. World football's governing body prohibits political, religious or commercial messages on shirts. UK Prime Minister Theresa May has called the rule "outrageous". English FA chief executive Martin Glenn told BBC Sport that players from both sides would wear black armbands carrying the poppy symbol - traditionally used to remember those who died during World War One - "as a point of principle". The SFA also confirmed it "intends to pay appropriate tribute by having the Scotland national team wear black armbands bearing poppies". England play Scotland at Wembley on 11 November in a World Cup 2018 qualifier. The Football Association of Wales has also written to Fifa requesting permission to wear poppies on armbands during their game against Serbia in Cardiff on 12 November but has not yet committed to defying the ban. However, Glenn said: "We are standing shoulder to shoulder with the other home nations on this, we all feel very strongly. It's not a political symbol and I think most people would agree with us." A points deduction could be one option open to Fifa should it decide to punish the FAs for flouting its ban, but Glenn does not believe it will come to that. He explained: "We don't think we are breaking their law - we think they are misinterpreting it. I'm confident it won't come to anything draconian." When the issue arose in 2011, a compromise was reached in which players were allowed to wear armbands with the poppy symbol. Archive: Why do people wear poppies? The FAs of England and Scotland had asked Fifa for permission to do the same next week, but have been told that would breach the laws of the game. Both FAs say they are continuing to negotiate with Fifa and are hopeful of finding an amicable solution, but Samoura questioned why an exception should be made for England, Scotland and Wales. "We have to apply uniformly and across the 211 member associations the laws of the game," she said. "Britain is not the only country that has been suffering from the result of war. The only question is why are we doing exceptions for just one country and not the rest of the world?" Asked if the teams could be punished for defying the ban, she said: "It is not really my ambition to punish anybody. "They just have to recognise themselves that they are part of the rules of the game and they should be ready to face any kind of sanctions or measures." She added any potential punishment could depend on whether a complaint is made. A petition urging Fifa not to uphold the ban has attracted more than a quarter of a million signatories. Earlier on Wednesday, the issue was raised in Parliament. "Before they start telling us what to do, they jolly well ought to sort their own house out," said Mrs May, citing the recent Fifa corruption claims which have seen dozens of former officials prosecuted or banned from the sport. "Our football players want to recognise and respect those who have given their lives for our safety and security. It is absolutely right they should be able to do so." Speaking at Prime Minister's Questions, Mrs May said the wearing of poppies was a matter for the English and Scottish football associations to resolve, but there was a "clear message" from the House of Commons that "we want our players to be able to wear those poppies". Are other countries shown leniency? Fifa has been accused of double standards after it emerged Republic of Ireland players wore a political symbol on their shirts in a friendly against Switzerland on 25 March to mark the centenary of the Easter Rising. Damian Collins MP, chairman of the Commons' Culture, Media and Sport select committee, said he had called on Fifa to "clarify the issue". "That appears to be an absolutely classic example of leniency being shown to other countries," Collins said. Can Fifa still change its mind? The Ifab meets on Thursday, where the Scottish and English FA chiefs Stewart Regan and Glenn have said they will be hoping to convince officials to allow players to wear poppies. FAW chief executive Jonathan Ford will also be at the meeting. FA chairman Greg Clarke told ITV News that English football's governing body was "negotiating in good faith with Fifa to try and find a solution". "My personal opinion, and that as chair of the FA, is that of course we should wear poppies," said Clarke. "That is our plan. There will be poppies at Wembley." Former Culture, Media and Sport Secretary John Whittingdale MP said the England team should wear poppies - even if a points deduction is possible. Speaking to BBC Radio 5 live's Emma Barnett, he said: "For [Fifa] to try and brand the poppy as a political symbol shows a total misunderstanding. "There are a number of reasons why we are already profoundly unhappy with Fifa's behaviour and conduct and this adds to that list." 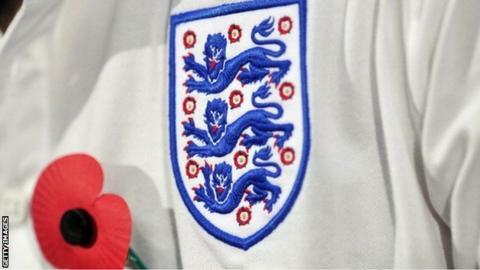 A motion has been lodged at the Scottish Parliament calling for Fifa's poppy ban to be scrapped. How would a points deduction affect the nations' qualifying chances? England are top of their 2018 World Cup qualifying group with seven points - two more than Lithuania and Slovenia - after three games, with Scotland fourth on four points. Only the top team qualifies automatically for the World Cup in Russia, with the second-placed side possibly entering a play-off. Wales are third in Group D with five points, two behind Serbia and the Republic of Ireland. Is it the same for other sports? Rugby Football Union chief executive Ian Ritchie has confirmed the England players will wear poppies on their shirts for the autumn Test against South Africa at Twickenham on 12 November. World governing body World Rugby has been "very supportive", according to Ritchie. "We are commemorating and remembering all people who have died in conflict. This is not a partisan thing or a political statement," Ritchie told BBC Radio 5 live. "This is something that is just right as an act of remembrance, and it is right to do it on the weekend when we play South Africa." Wales' rugby team will also wear a commemorative poppy on their shirt in their Test against Argentina on the same day. Read more on Is the poppy a political symbol?